This blog needs an update. The show in Maine (DowlingWalsh.com) went well and brought in almost enough to finish the Hungku Water Project, but then came the bills... pay the gallery, framers, etc. and it was almost gone so i created a poster to sell at lectures, film showings, etc. and feedback on the road raising money. The poster is a collaboration with Moses. He made the central map of Mt. 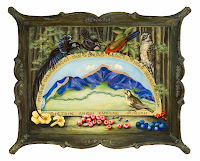 Hungku and I made the surrounding endemic and endangered birds found on his land. them into Indonesians... The army builds(concrete) houses, moves the people into them and from there on they have to fend for themselves." And so they were in a concrete house with a few of their little stripped wild pigs and a tiny parched garden all hot and dusty. Earthquakes were disturbing Indonesia and disrupting transportation. I experienced a small one. 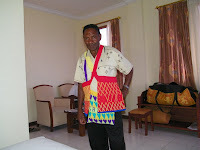 My guide Yoris was not his usual self and required a thousand dollars to go with me to Hungku. Moses wanted to take me a "new" way but it would take time to arrange porters and I'd be without Yoris. After weighing the options I decided to wait a year so i could check on the "new" route and change Yoris' mind. 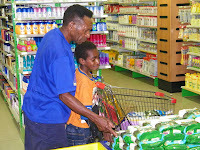 Instead, we took Moses and his grandson to the new modern Manokwari supermarket. The little ten year old was terrified but soon helped Moses fill two grocery carts with items of their choice (soap, toothpaste, salt, rice, canned meat, etc.) Cash courtesy of Greta Howard of Marblehead. our largest donors, Kim Harbin and Hunt Slonem. I left Moses a disposable camera and in November he returned it with very good pictures of bowers "one" and "two". I was disappointed it was not Leanardo or Warhol, but glad to know he had returned to the mountains and could use the camera. 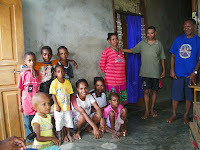 All Money donated has been converted to local currency and remains in Manokwari at Bank Mandiri gaining interest. Martin Watofa, our engineer will tell us when we have enough to do serious buying(to avoid storage charges and damp cement). At least the tribe is learning about money and banking.